For an opening night for the Wizards, there definitely was no shortage of energy going through the building in the fourth quarter that would have rivaled a playoff game any day. Unfortunately for the Wizards, it was one shot from a familiar foe, Kelly Olynyk that sucked the playoff result right off the Wizards bench with 0.2 remaining in the game and resulted in their first loss of the season. Olynyk was booed every time he touched the ball and this dates back to his days as a player with the Celtics, but after Dwyane Wade too the ball to the hoop in what should have been the final missed shot of the game, Olynyk found himself another hero for the Heat and against the Wizards. The Heat trailed by as many as nine points in the final nine minutes that led up to this final shot by Wade. Wade, who has sort of taken a back seat to the younger Heat team, in what he has called his very final season, certainly showed his veteran leadership on the court tonight. 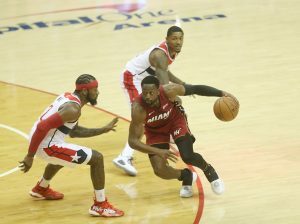 Josh Richardson led the Heat with 28 points, Rodney McGruder added 20, but it was the consecutive 3’s that the Heat dropped in the fourth quarter, topped off by a missed free throw by John Wall that led the eventual difference in the game.